I went into Justice League having no real knowledge of the backstory, not having seen any of the related films. This might be a problem, some said. With long running, intertwined story lines, cast across multiple films, there would be key plot points that this film would have to assume I knew. I was mildly apprehensive. How much of the 121 minute running time would I spend wondering why these characters seemed to be so unhappy about working together? How many in-jokes would be lost on me? Would any of it really makes sense? Would it just be one long, confusing fight scene? Or could I just enjoy it as a spectacle of its own. In the end, in was a little of all these things. One provided "spoiler" from a previously unwatched film – Superman Vs. Batman – established the main plot point that I wouldn't have had any idea about, and eased me into Justice League with just enough information to get by. 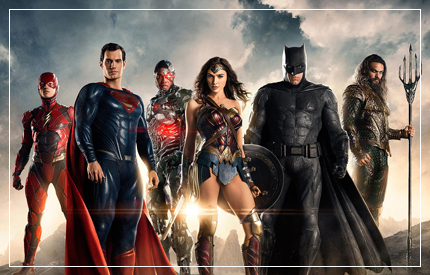 Beyond this, there was obviously quite a lot I was missing – some of these characters have long established, and as stated before, intertwined backstories – but thankfully it didn't impact my enjoyment of Justice League as a stand alone action film. Now, as a stand alone film it's not got a huge amount going on really – a thing is gonna happen, a bad thing, we have to get ready, no really, come on now, we have to get ready... Are you ready... Here it comes... HERE IT IS! Done. Everyone comes fully established, or at least they aren't going to spend any time on the who, what, where, when and why. Its just build up, build up, build up, THING, W'HOO! You are dropped into the middle of the thing and you're just gonna have to go along with it. Thankfully, the thing was enjoyable enough to hold me attention for the lengthy – given how little actually really happens – running time. A lot of my enjoyment might have been thanks to the Flash. He's a great character and adds a much needed lift to what could tip a little too far into faux angst. Aquaman is cool. Wonder Woman makes me really want to go watch her stand-alone film. I have some issues with Superman – he looks like an Action Man figure, but I guess that is actually kind of appropriate. I did read another review that said this was the first time the inherent danger that lies at the core of Superman was touched upon, and that makes sense to me. I think I just find him a bit wooden. I'm still making up my mind about Ben Affleck's Batman, this being my first time seeing him in the role. I think I like and dislike almost the same things about him – he doesn't look good as Batman. Like his face doesn't really seem to even fit in the mask. But then, when I think of what Batman is – ie the only one that is actually human, that doesn't have any superpowers – perhaps that's as it should be. Perhaps the physical appearance of Affleck's Batman is the ideal representation of what that character is. But hey, what I do I know, this is a whole (comic book) world I know nothing about. So, Justice League is grand. If your super into it, and have seen all the others, you'll probably dig it. If, like me, your going in completely ignorant, there's probably enough to keep you entertained, if you can ignore the utter terrible CGI villain. I'd actually forgotten about that. It's terrible. Like 80's cartoon terrible. But hey, the Flash is still cool.